An agreement between North Carolina State University and North Carolina Central University was signed Monday, June 22, instating a new dual degree program. The 3-plus-2 degree gives students the opportunity to earn a bachelor’s degree in physics from NC Central University and a bachelor’s degree in electrical engineering from NC State. The dual degree was developed in March 2015 through a memorandum of agreement between NC State’s Department of Electrical and Computer Engineering and NC Central’s Department of Mathematics and Physics. In the dual degree format, students attend NC Central for three academic years following the physics curriculum. Then, the students would transfer to NC State for two academic years following the NC State electrical engineering curriculum. “This program is a great opportunity to broaden the opportunities for students to pursue STEM degrees, which provides an inviting chance for the student to receive two degrees,” said Dr. Caesar Jackson, interim dean for the school of graduate studies at NC Central. The goal of the five-year program is to provide graduates with knowledge of mathematics, science and engineering in order to broaden career opportunities while also increasing access, diversity and enrollment in a STEM discipline at both institutions. “My hope is that this program will provide a mechanism to recruit bright and ambitious students to NC Central and NC State in support of our shared goals around access and student success,” said Dr. Jerome Lavelle, associate dean of academic affairs in the College of Engineering at NC State. 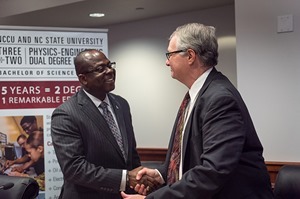 Dr. Johnson Akinleye, provost and vice chancellor for Academic Affairs at NC Central, and Dr. Warwick Arden, provost and executive vice chancellor at NC State, signed the memorandum at NC Central. Courses taken at either university will be transferred toward fulfilling degree requirements in both programs. The dual degree students will be eligible to apply for graduation from either or both institutions. The program will officially launch in August 2015. For more information about the program and admission requirements, visit: The 3-Plus-2 Dual B.S. Degree. Source : College of Engineering News article, “NC State and NC Central create dual degree program in physics and electrical engineering”, by Darsee Heath.